This balloon penetration trick has been named Watch it Buster! This magic trick involves skewering a balloon without the balloon bursting, unless you want it to. This trick is based on the classic “Needle Through The Balloon Trick” where a needle around 30cm in length, usually decorated with a ribbon or wool threaded through it’s eye, is inserted in one side of the balloon and exits through the other side without the balloon popping. This Balloon Penetration Trick is our version of the classic magic trick. After first discovering and learning the Balloon Penetration trick, I was reluctant to include it in my routines for a number of years. Upon learning the tricks secret, I assumed the audience would not be impressed with the technical side as of the magic trick. It seemed a little too simple and obvious. I never appreciated the tension from the thought of the balloon popping that arose among the audience. It turns out that this same tension is what makes the Balloon Penetration trick so popular. When the needle approaches the balloon you can see the audience tighten up and grimace in anticipation of what will happen. 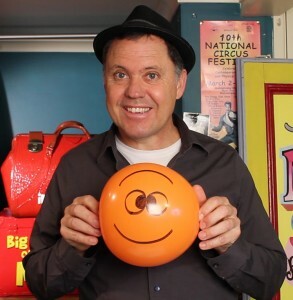 Just as you prepare to insert the needle into the balloon you announce “Wait a minute” with a grin on your face. This causes mass relief within the audience as they are once again they are relaxed. This step is repeated as you build tension and abruptly halt proceedings. This usually brings on more laughter and nerves within the audience. Finally you build the tension and insert the needle into the balloon. When the balloon has be penetrated and the needle does not pop the balloon, the crowd will usually fall silent. I once mistook this silence to mean that the audience was not interested but it was the opposite. People are so shocked that their brains are working so hard to find any possible explanation and they are rendered silent. This can be a great sign that the magic trick is a keeper. All the materials to make this trick successful are found in most kitchens. This means that it is slightly edited from the original trick but it’s great for a trick to add to your performance. Be sure to download a copy of them on an A4 piece of paper so you can always have them on hand if you can’t find the video or webpage again, just click the picture. I also used the Timmy Toilet Paper Gag by Tom Burgoon. He has a fantastic routine that his career is based on using Timmy. Be sure to search “Timmy Toilet Paper” and buy it from Tom. It was published in Genii Magazine in February 2004. 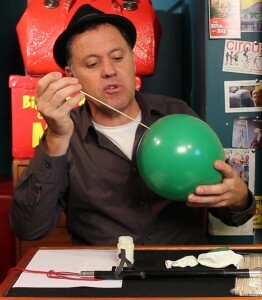 This magic trick goes great with Magic Lessons #23 – Cut and Restored Balloon. Check it out if you liked this magic trick. Get your free download by clicking the button! Did you enjoy this Balloon Penetration Trick? To learn more simple magic tricks Click here!